The value of farmscaping for insect pest management in organic vegetables was examined in 2010 in broccoli and cucumber in Georgia with four treatments: (1) the vegetable, broccoli or cucumber, (2) buckwheat, (3) a 50:50 mixture of dill and fennel, and (4) a 50:50 mixture of sunflower and yarrow. Pest and beneficial arthropod abundance and parasitism rates of pests showed no clear relationships with treatments. Pest-natural enemy ratios varied among treatments, but did not appear to be affected by flower treatment. However, analyses are in early stages and the data from 2011 will be critical. OBJECTIVE ONE — Quantify the impact of floral farmscaping on vegetable pest management. Broccoli (var. ‘Windsor’) seed was planted in the greenhouse in Athens using Fafard Organic Planting Mix in January 2010 to obtain transplants for the field trials. Transplants were placed in the field in Tifton on 22-23 March in organic certified land that had been previously planted in a cover crop of sunn hemp. One month prior to planting, the field was tilled and spread with one ton of organic pelletized poultry litter (4-2-3 NPK) to provide approximately 40 kg of N to the field, in addition to the N available from the sunn hemp residue. Transplants were placed in two rows on 2-meter-wide beds, with 30.5 cm between plants within rows and 1.2 meter between rows. Drip tape was run down each plant row to allow irrigation as needed. Plot sizes originally proposed for the project were 20×20 meters, but limitations in numbers of plants required that we reduce the plot size to 12×12 meters. Plots were separated from one another by 5 meters of tilled bare soil within rows and 2 beds (~7 meters) of bare soil across rows. Broccoli in Athens was transplanted on 1 to 30 April in the same configurations as those used in Tifton. The field had been previously covered with an Austrian winter pea/oats winter cover crop blend, which was tilled into the soil three weeks prior to the initiation of transplanting. Three tablespoons of feathermeal were applied to each transplant as it was placed to provide nitrogen for growth. At both Tifton and Athens, a 2 x 2 m planting was placed in the center of each plot, comprising the farmscape treatment. Four farmscaping crop treatments were evaluated: (1) a broccoli control, (2) a buckwheat planting, (3) a mixture of two Apiaceae – fennel and dill, and (4) a mixture of two Asteraceae – yarrow and sunflower. Treatments were replicated four times at each location. The selection of flowering plants in these families is based on the widespread use of these taxa for farmscaping, and the documented attractiveness of these plants for natural enemies. Fennel, dill, yarrow, and sunflower were all initiated in flats the greenhouse from 14 to 21 January 2010. Buckwheat was initiated in the greenhouse in Athens on 10 March and in Tifton on 26 February 2010. All flowers were transplanted to the field. Only buckwheat was flowering at the time of transplant. Most others began flowering within one (dill) to three (fennel) weeks of being transplanted in the field. Yarrow failed to flower until the broccoli experiment was concluding. Sampling in Tifton was conducted from 20 April until 25 May. Sampling in Athens was conducted from 18 May until 22 June. Cucumber (var. ‘Marketmore 76’ organic) seed was planted in the greenhouse in Tifton using Miracle-Gro Organic Planting Mix on 10-11 May and in Athens using Fafard mix on 11 to 18 May to obtain transplants for the field trials. One month prior to planting in Tifton, the field was tilled and spread with one ton of organic pelletized poultry litter (4-2-3 NPK) to provide approximately 40 kg of N to the field. Transplants were about to be placed in the field in Tifton on 10 June in organic certified land that had been previously fallow. However, on the day that transplanting was to begin, a farm worker knocked down a power pole on the greenhouse containing the transplants. Without the cooling system, the greenhouse temperature climbed to at least 150F (that was the upper limit of the thermometer) and seriously injured the transplants. We attempted to transplant them in the field, but fewer than 20% survived. In an effort to salvage the experiment, we planted 9,000 seeds on 17 June, after the power was restored. However, by the time the transplants were moved to the field (15-16 July), temperatures were extremely high and few of the plants survived. As a result, we were compelled to terminate the Tifton location. Cucumbers in Athens were transplanted on 23 June to 7 July in organic land previously treated with one ton of greensand, and with feathermeal applied at transplanting as described for the broccoli above. Transplants were placed in two rows on 2-meter-wide beds, with 30.5 cm between plants within rows and 1.2 meter between rows. Drip tape was run down each plant row to allow irrigation as needed. As with broccoli, plot sizes originally proposed for the project were 20×20 meters, but we reduced the plot size to 12×12 meters. Plots were separated from one another by 5 meters of tilled bare soil within rows and 2 beds (~7 meters) of bare soil across rows. A 2 x 2 m planting was placed in the center of each plot, comprising the farmscape treatment. The same four farmscaping crop treatments were evaluated as for broccoli: (1) a cucumber control, (2) a buckwheat planting, (3) a mixture of two Apiaceae – fennel and dill, and (4) a mixture of two Asteraceae – yarrow and sunflower. Treatments were replicated four times at each location. The selection of flowering plants in these families is based on the widespread use of these taxa for farmscaping, and the documented attractiveness of these plants for natural enemies. Fennel, dill, yarrow, and sunflower were transplanted from the broccoli plots to the cucumber plots, and all were in full flower. 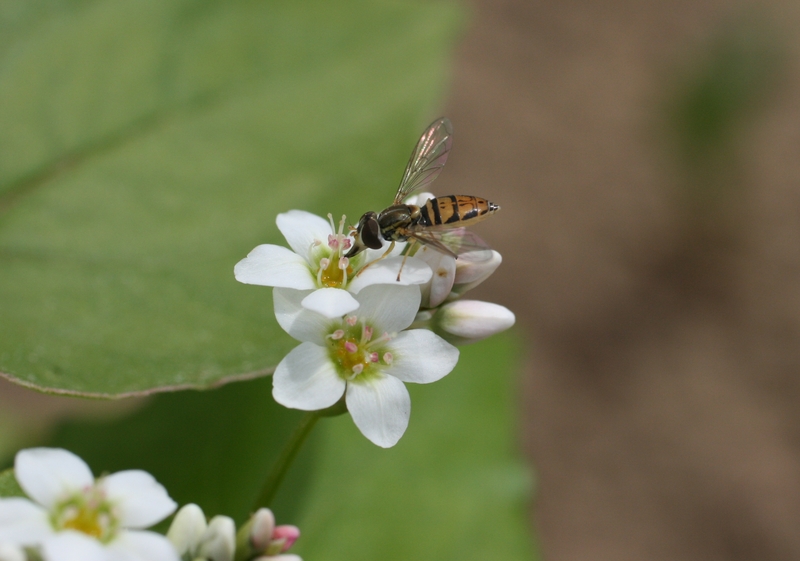 Buckwheat was initiated in the greenhouse in Athens on three weeks prior to transplanting and was initiating flowering at the time of transplanting to the field. Sampling was identical at both locations and in both crops. Arthropods on plants were identified and counted on an approximately weekly basis (between 0800 and 1200 EDT), weather permitting. The same plants were not sampled in consecutive weeks to limit disruptions to the sampled plants. The central experimental plot was sampled by recording arthropods observed on each of 10 plants in a 15-second period per plant. In treatments with two flowering plant species in the central block, five plants of each flowering species were evaluated. Representative specimens of pest and natural enemy species observed on the plants were collected and returned to the laboratory for identification and development of a voucher collection. In the vegetable portion of the plots, one crop plant was evaluated in the center and at 4 meters from the central planting in each cardinal direction, for a total of 5 plant observations per plot. Arthropods observed on the plants will be identified and counted. Pest eggs and all caterpillars found on sampled plants will be collected and held in the laboratory to assess parasitism. Aphid mummies (parasitized aphids) were recorded when observed on plants to assess aphid parasitism, and subsets collected for parasitoid identification. Pitfall traps were placed in the central farmscape plot and at each sample location in the plots (4 meters in the cardinal directions from the plot center) to monitor ground-active species, for five traps per plot. Pitfall traps consist of two plastic cups, with one inserted into the other, placed in the ground to passively trap ground-active species. One cup (24 oz) has its bottom removed to form an open tube. This cup is inserted permanently into the ground to function as a stable liner for the opening. The second cup (16 oz; 10-cm opening at mouth) has two 2-cm circular holes cut into each side of the cup 5 cm above the bottom of the cup, and each hole is covered with fine mesh. These holes serve as drains in the event of rainfall. The smaller cup is inserted into the larger liner cup, and the bottom of the cup is filled to the 3-cm mark with a combination of water, three to five water softener salt pellets (to help preserve trapped specimens), and 1 ml of Tween 20 surfactant (to prevent escape from the water). Traps were left in the field for a week then were replaced with a fresh trap. Arthropods collected in the pitfall traps are currently being mounted in preparation for identification and counting. Specimens will be identified at least to genus and counted. Processing of the pitfall samples will be ongoing in Years 2 to 3. Pitfall traps capture a large number of specimens, and often of a diversity of species. As a result, processing the traps is time- and labor-intensive. Sentinel pest prey were placed at each sample location twice monthly to monitor predator activity during the growing season. Egg masses of the beet armyworm were used for this purpose, as they can be readily produced in the laboratory, are significant pests of a variety of vegetables, and provide a straightforward measure of predation and loss. We have successfully used beet armyworm eggs and larvae in the past to assess predator and parasitoid activity in cotton (e.g., Chen et al. 2008). Egg masses of 30 to 50 eggs each were attached to the undersides of leaves of crop plants and left in the field for three days. Egg masses were photographed digitally at 24-h intervals to permit us to assess egg loss with minimal disturbance to the eggs. After 3 days, remaining egg masses were collected and returned to the laboratory for a final evaluation of egg loss. The rate of egg mortality in the egg mass was assessed using initial egg counts, digital images, and the final number on the collected egg mass. These data will ultimately be combined with the parasitism and pest population dynamics data collected in the whole-plant observations to establish rates of pest mortality and loss in association with the various farmscape treatments in relation to time and distance from the central farmscape. These evaluations will help characterize possible mechanisms for the results, as we can assess rates of loss over time at graded distances from the farmscape block. Plant injury was assessed every other week of the growing season in two ways. First, leaf injury was evaluated on a 0 to 4 scale for two leaves on one plant at each sample location, one in the middle third of the plant and one in the upper third of the plant. Zero indicates no damage, 1 signifies 1 to 25% damage, 2 represents 26 to 50% damage, 3 denotes 51 to 90% damage, and 4 indicates >90% damage. Second, when flower heads/fruiting structures became apparent on the plants we evaluated the fruit for injury (incidence and final grading). At the end of the season, flower heads or fruit were assessed to quantify the impact of arthropod pests on the vegetables under the guidance of Dr. Juan Carlos Diaz-Perez (UGA). 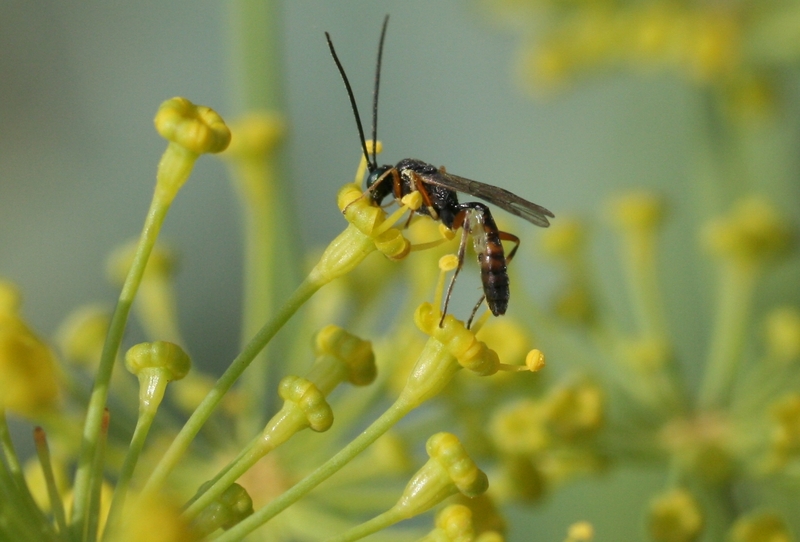 Pests and Natural Enemies in Broccoli: The insect pest complex at both Tifton and Athens was dominated by aphids (mostly cabbage and turnip aphids, although species were not separated in the field) and the diamondback moth, Plutella xylostella. This is a foliage-feeding pest of cruciferous crops that can also become a problem by entering the broccoli heads. Several other pests occurred, but they were sporadic and presented no significant threat to the crop (imported cabbageworm, Artogeia (=Pieris) rapae; whiteflies, Bemisia sp. ; and harlequin bugs, Murgantia histrionica, late in the season). There was a numerical tendency for pests to be more abundant in the broccoli-only treatment relative to the floral treatments in Tifton, but variability in numbers was quite high and no statistical difference emerged (Fig. 1). In Athens, numbers of diamondback moth larvae on broccoli were similar among all of the treatments except buckwheat (although this difference was not statistically significant) and aphids and cabbageworms were comparable among treatments (Fig. 2). Overall pest abundance in Athens was lower than that experienced in Tifton. Like pest abundance, natural enemy abundance was quite variable among treatments and across locations (Figs. 3 and 4). As was the case with pests, natural enemies were more abundant in Tifton than Athens. At both locations, aphid parasitoids in their hosts (=aphid mummies), ladybeetles, and spiders were the most commonly encountered natural enemies. The overall ratio of pests to natural enemies varied by location and treatment, with no clear pattern emerging (Figs. 5 and 6) in the initial phases of the study. Natural Enemy Abundance and Efficacy in Broccoli: Parasitism rates for larvae of the dominant pest, the diamondback moth, tended to increase as the season progressed at both locations (Figs. 7 and 8). Parasitism rates in Athens jumped most in buckwheat, which also had the lowest numbers of diamondback moth larvae. Otherwise parasitism rates rarely exceeded 30% (Fig. 7). In Tifton, rates of diamondback moth larval parasitism was rarely less than 40% in any treatment, and at the end of the season exceeded 70% in all treatments (Fig. 8). In both locations, the dominant parasitoid was the ichneumonid larval-pupal parasitoid Diadegma insulare (Figs. 9 and 10). The second most abundant parasitoid was the braconid larval parasitoid Microplitis plutellae. These two species were the only parasitoids of diamondback moth larvae encountered in Tifton (Fig. 9), whereas a third parasitoid species, a chalcidoid which we have not yet determined, was found consistently in Athens (Fig. 10). Parasitism of aphids was low to moderate at both locations (Fig. 11), with no clear correlation with aphid abundance. Pitfall trap and sentinel prey evaluations for 2010 are still underway, with sorting and mounting of the large number of specimens currently proceeding, and counts of eggs in images being completed in the laboratory. These results will be reported in the 2011 report. Arthropods on Flowering Plants: The specimen identification and counting of the numerous arthropods collected from the flowers will be completed in years 2 and 3 of the project. However, the intern Heather Savelle began examining the diversity of arthropods on the flowering plants and the taxonomic similarity of arthropods found on broccoli with that of arthropods on the flowers. Arthropods were sampled in the floral centers of each plot by aspirating specimens from 10 plants for 15 seconds per plant. In addition, an aerial sweep was made across the top of the floral planting subplots with a 37-cm aerial net. All arthropods collected by aspiration and in the aerial net on 18 and 25 May 2010 (in Tifton) were killed, mounted, and grouped into Orders and to designated morphospecies within Orders for subsequent analyses. Following identification to Family, specimens were further subdivided into groups that were potential pests and others that were potential natural enemies of pests. Biodiversity in relation to flower treatment, and species similarity between collections on the flowers and the crop, were examined using the EstimateS program (http://viceroy.eeb.uconn.edu/estimates) to calculate several biodiversity and similarity indices, focusing on the raw and estimated Chao-Jaccard abundance-based index. The shared beneficial species values using the Chao-Jaccard raw–abundance-based index are summarized in Figure 12. Based on the raw data, fennel had by far the highest shared beneficial species value with 0.371. Dill and buckwheat were very similar with values of 0.127 and 0.12, respectively. Yarrow had the lowest value with 0.074. The shared species values using the Chao-Jaccard estimated-abundance-based index are summarized in Figure 12. The pattern of shared pest species between broccoli and each of the floral plantings changed drastically. Fennel remained the highest with a value of 1.688. Yarrow’s shared species value increased drastically with a value of 1.552. The shared species value for dill was 0.678 and buckwheat’s value hardly changed at 0.158. Several diversity indices were calculated using EstimateS, but the Chao 2 mean, and 95% upper and lower bounds were used in data analysis. The mean value indicates diversity based on actual data collected from the study. The upper bound value estimates the upper level of diversity that may be reached over time or with a larger sample size. Both pest and beneficial diversity are summarized in Figure 13. Pest diversity was highest in fennel followed closely by dill and yarrow. Buckwheat indicated the lowest pest diversity, less even than broccoli. However, as indicated by Figure 13, broccoli has the greatest potential diversity for pests over time, as do dill and fennel. Buckwheat and yarrow exhibit the lowest pest diversity potential. In all flowering plants, the diversity potential is much greater than the actual diversity revealed by sampling insects during the study. Beneficial diversity was much greater in all flowering plants than pest diversity. Yarrow had the highest beneficial diversity followed by fennel. Both dill and buckwheat were lower in beneficial diversity than broccoli. As with pest diversity, all flowering plants and broccoli show a much greater diversity potential than indicated by the mean diversity values based on actual data collected. Yarrow had the highest diversity potential followed by broccoli. Fennel, dill, and buckwheat all had lower potential diversity values than broccoli, but all were still relatively high. Flowering of the plants used in the broccoli study was variable. Buckwheat flowered over a period of approximately five weeks, spanning the experimental period. Dill likewise flowered throughout. Fennel initiated flowering approximately 3-4 weeks into the project, and yarrow began flowering after four weeks. Sunflowers flowered after 2-3 weeks and continued for the remainder of the experiment. Buckwheat thus provides a good initial flowering plant, whereas dill requires some time from germination to flower that may be effectively bridged by buckwheat. Fennel and yarrow were both slow to flower, but supported a variety of arthropods in their vegetative forms prior to flowering. Sunflower flowering will be highly dependent on the variety used, but more rapidly flowering forms may integrate well with buckwheat and dill in a more persistent flowering blend. Evaluations of our arthropod surveys will be critical in making additional decisions about risks and benefits of these particular species as farmscape plants. More data are needed before conclusions can be drawn from these ecological statistics. We will continue gathering data from the numerous specimens collected in 2010 and will add to them in 2011. Yield and Quality in Broccoli: Yield and quality data have been collected, but are not yet summarized and analyzed. They will be included in the 2011 report. As noted above, the cucumber trial in Tifton was aborted due to transplant mortality from greenhouse overheating. Therefore, the only results presented here are from Athens. We are still in the early stages of sifting through the cucumber data, so the results will be delineated more fully in the 2011 report. Pests and Natural Enemies in Cucumbers: The insect pest complex on cucumber in Athens was dominated by cucumber beetles (Diabrotica spp.) and squash bugs, Anasa tristis (Fig. 14). Several other pests occurred less consistently (melonworm, Diaphania hyalinata; and leafhoppers), of which the melonworm was the most serious problem due to its direct feeding on fruit. There was a numerical tendency for cucumber beetles to be more abundant in the cucumber-only treatment relative to the floral treatments, but variability in numbers was quite high and no statistical difference emerged (Fig. 14). This may reflect the higher numbers of cucumber plants in the cucumber-only plots, although the floral plot accounted for only 2.8% of the total area. Squash bugs occurred in all treatments, as did melonworms and leafhoppers, although generally at lower numbers. Like pest abundance, natural enemy abundance was quite variable among treatments (Fig. 15). Ladybeetles were the most common natural enemies encountered in the cucumber, although their typically prey (aphids) were found in only very low numbers (a total of 3 aphids were observed on cucumbers during the experiment). 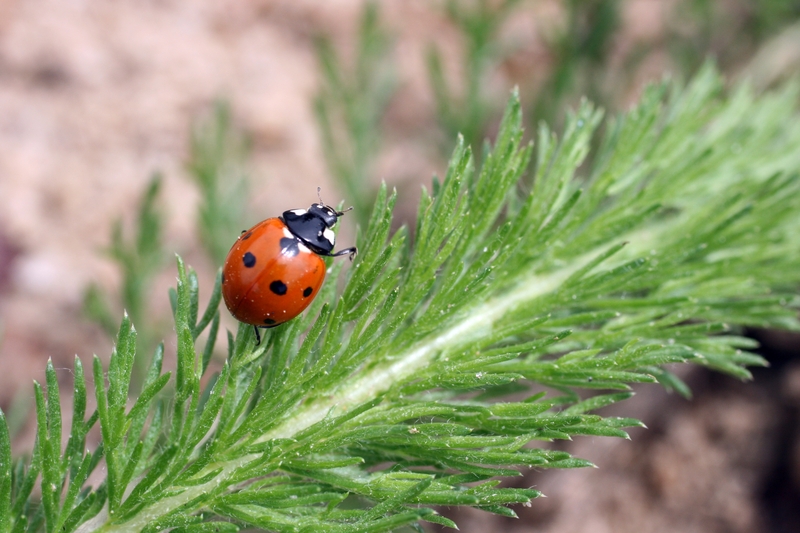 The three species most often encountered were the native Hippodamia convergens, and the two exotic species Coccinella septempunctata (C-7) and Harmonia axyridis. 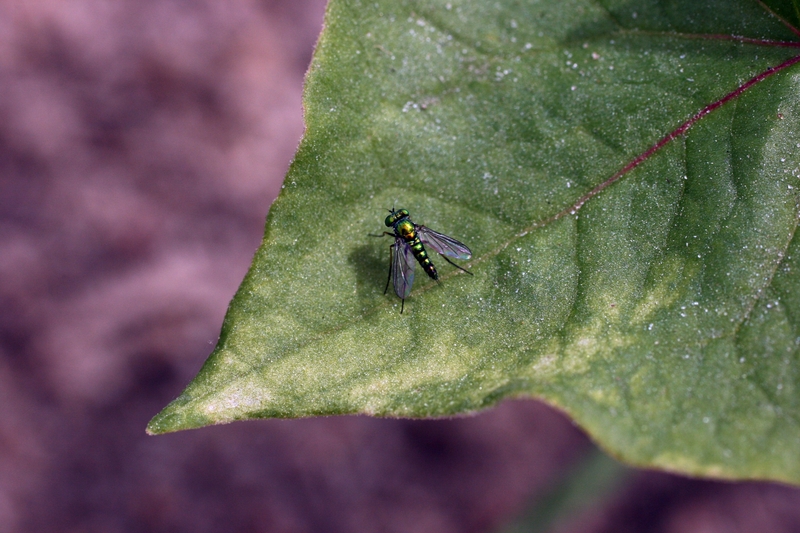 Big-eyed bugs, Geocoris spp., also were encountered, but chiefly in the cucumber and buckwheat plots. Hover flies (Syrphidae) were observed in some plots, and spiders were also relatively common in all treatments. The overall ratio of pests to natural enemies varied among treatments, with no clear pattern emerging (Fig. 16) in the initial phases of the study. The overall ratio was greater than that observed in broccoli, which is to be expected given that cucumbers were grown later in the season when more arthropod species are active. Natural Enemy Abundance and Efficacy in Cucumbers: Pitfall trap and sentinel prey evaluations for 2010 are still underway, with sorting and mounting of the large number of specimens currently proceeding, and counts of eggs in images being completed in the laboratory. These results will be reported in the 2011 report. Arthropods on Flowering Plants: Specimens collected on flowers are currently being mounted and identified. We will have firm data to report in 2011.We have begun acquiring quality images of insects on the respective flowering plants. Several examples are attached to this report. All images were taken by Mr. Russell Ottens, University of Georgia. Yield and Quality in Cucumbers: Yield and quality data have been collected, but are not yet summarized and analyzed. They will be included in the 2011 report. Broccoli and flower transplants have been initiated at both locations. Broccoli and flowers have been transplanted to the field in Tifton and sampling will be initiated the week of 4 April 2011. Broccoli and flowers in Athens will be transplanted to the field at the end of April, with sampling to be initiated approximately two weeks later. Broccoli and cucumber transplants will be grown on plastic mulch (black for broccoli and white for cucumbers) in 2011 to better manage weeds at both locations. Flowers for placement in Tifton, Athens, Douglas, and Sylvania for arthropod sampling (Coreopsis, Indian blanket, Phacelia, Agastache, and Cilantro) are currently growing in tubs in Athens and will be transported to the respective locations beginning in mid-April. Arthropod sampling on those plants will be initiated the week following transfer. The project was featured in a field-day event at the Georgia Organics meeting in Athens, Georgia (18-20 Feb 2010) when the project was a part of a field tour attended by about 70 participants. Two GIFT (Georgia Internships for Teachers) science teachers were employed on the project, one in Athens (Dianne Akins) and one in Tifton (Josh Bryan), for seven weeks in the summer of 2010. Ms. Akins is a high school chemistry teacher and Mr. Bryan is a high school biology teacher. Ms. Akins used her experiences in the SARE project to develop a course experiment evaluating soil microbial and chemical quality in relation to soil management practices. Mr. Bryan used his experiences to develop a set of experiments for his class addressing arthropod biodiversity in relation to plant diversity, and arthropod predation. In addition to these participants, 19 students in the class Organic Agricultural Systems (AESC 3125) in Athens and 6 undergraduate students in Tifton assisted with preparing transplants, and field maintenance. Thestudents in Tifton also assisted with sampling and data collation. The project included an intern in Tifton in 2010. The intern, Heather Savelle, is working on her Masters in Plant Protection and Pest Management at the University of Georgia, and worked on the SARE project for 3 months. She assisted with field sampling and maintenance, helped mount and identify specimens collected on flowering plants in the plots, and began analyzing the arthropod communities on the flowers (see above).